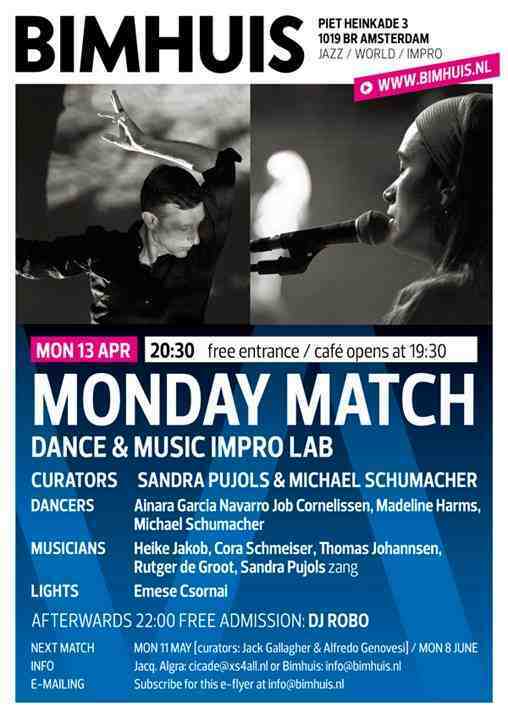 dance & music impro lab, which takes place every first monday of the month at 20.30 pm in the BIMhuis, Amsterdam. Entrance free. The goal is to encourage the exchange between improvising dance and music performers, coming both from various fields.This lab offers young starting performers a chance to meet experienced professionals and each other, and to approach the public on an internationally renowned stage. The evening is curated by a different couple every session, one coming from the dance and the other from the music field. They want to take the challenge to meet on stage and experience. Both invite other dancers/musicians,finding an inspiring balance between experienced and starting participants. The short documentary Monday Match 101 gives an impression of the celebration of the special 101 edition after 10 seasons.